I have loved to swim outdoors for as long as I can remember. I didn’t often, when I was growing up: my first seven years were spent in the middle of the Welsh countryside, and after that, Birmingham. My over-riding memories of swimming during my childhood were the nights spent coughing with an aching head and burning eyes after spending the afternoon at our local leisure centre, contrasted starkly with the freedom of swimming outdoors on holiday – in outdoor pools, the sea, lakes – it didn’t matter, just as long as I could escape the cloying claustrophobia of chlorine-filled air. I moved to London aged sixteen, and soon after discovered the Oasis sports centre in Covent Garden. It was a bit of a revelation. As often as I could, I would step off the grey and dusty streets and into its little outdoor pool – it was surrounded by tower blocks, but up above there was a rectangle of sky, and that made all the difference. Several years after that, having gravitated towards East London, I found the lido on London Fields. It had only recently re-opened, and I was instantly won over by the brightly coloured poolside changing rooms and the trees peering over from the park. It was a relief from the city heat in summer, but it was in the winter it really came into its own: stripping off the mummifying layers to swim lengths between the warm water and crisp, cold air. It made me feel so alive, clawing my soul back from the S.A.D. that threatened to engulf it every year as the darkness crept in. 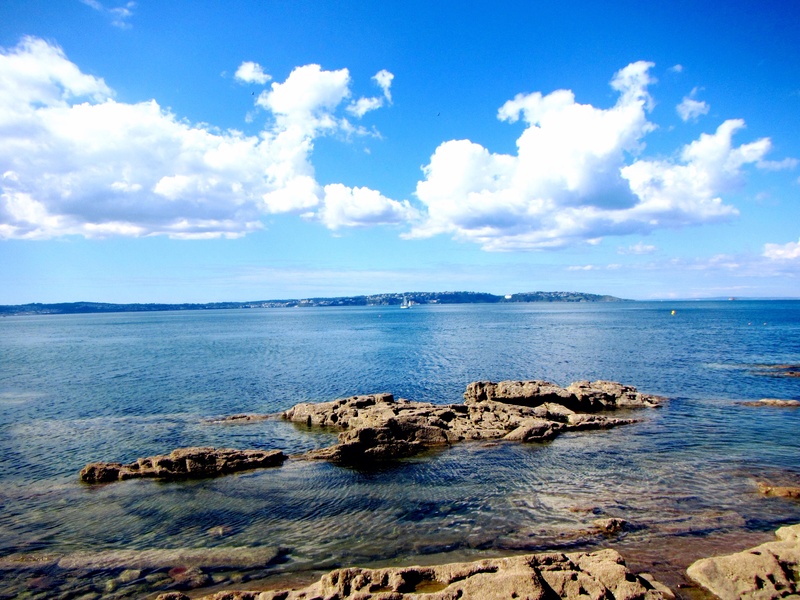 It’s not surprising, really, that I have found myself so consumed by Shoalstone since I moved to my new house by the sea. 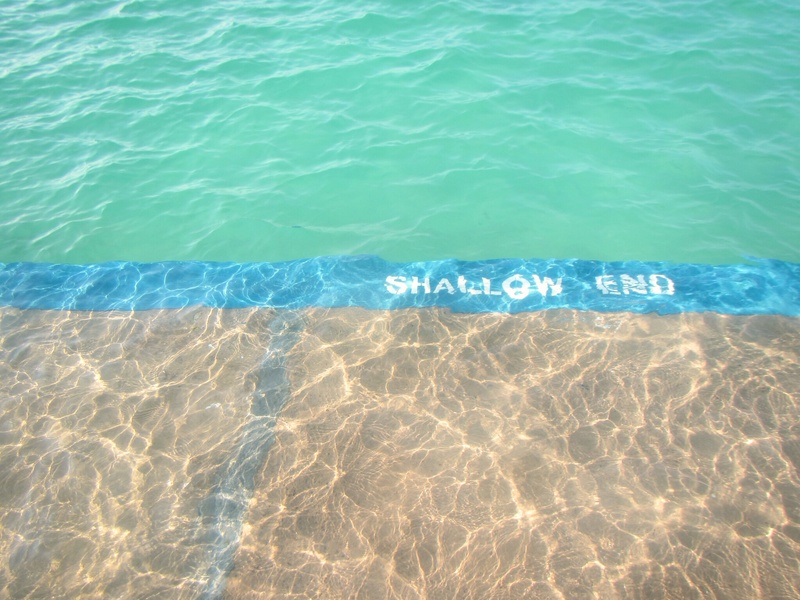 There is, after all, a narrative to continue: but it was only by listening to inspirational writers, artists, campaigners and fellow lido lovers speak at the first ever National Lido Conference last weekend that I realised it had always been there. It felt a strange thing to be doing as I headed up to Portishead on the train and the bus: two whole days discussing outdoor pools. I mean, I loved my local lido, but I was always a little self-conscious about how much it meant to me – I’d never quite been able to put my finger on the reasons why. And then as people began to speak I realised that there was a whole tribe here to which I very much belonged. This wasn’t just about pools. It wasn’t even just about swimming. It was about community, about equality, about inspiration, about freedom. It was about finding meaning in the chaos, about connecting with people and with nature, about the very essence of what it is to be alive. I had gone to the conference with a very specific and practical hat on: that of local councillor and chairperson of Shoalstone Pool. That persona, which sometimes feels accidental, is almost entirely separate to my writerly one, however much my town has begun to inspire my writing. 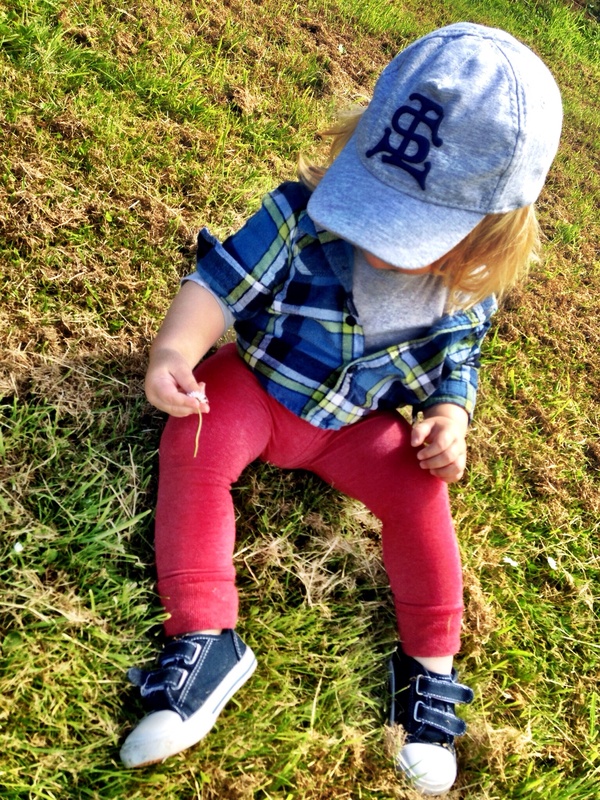 It soon became clear though that my other hat was just as welcome here – the one that dreams of better worlds, and tries to make sense of this one through carefully crafted words on a page. More than that, the weekend helped me to make sense of my entire self – the self that I’ve become – and to see how it has been woven out of the strands of my past that I thought I had long since left behind. I realise that all sounds a bit bonkers. Maybe the euphoria was simply the result of that age-old therapy of immersion in water. 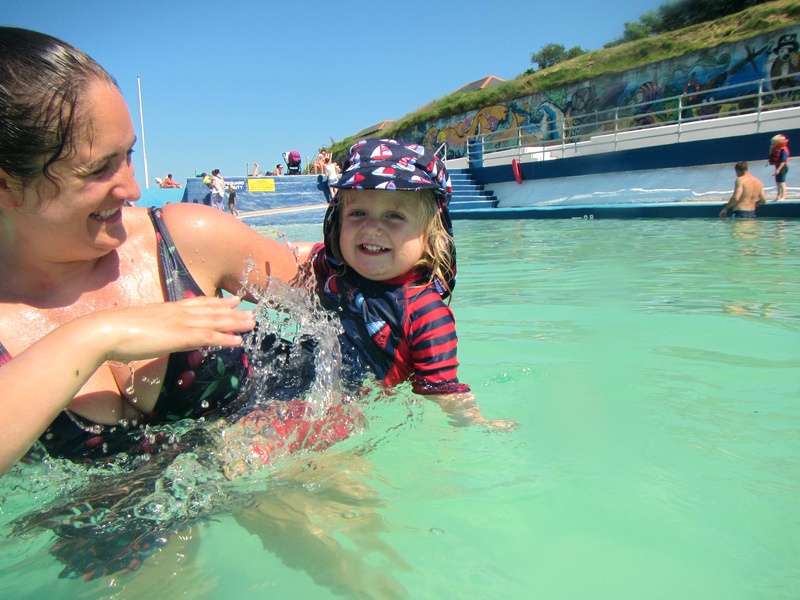 As part of our weekend there was of course the chance to swim – in Portishead Lido, and in the nearby Clevedon Marine Lake. Both were wonderful, in their very different ways – as was bobbing along next to almost-strangers, deep in conversation about this love we shared and how it might shape our futures and that of the pools we have taken guardianship over. 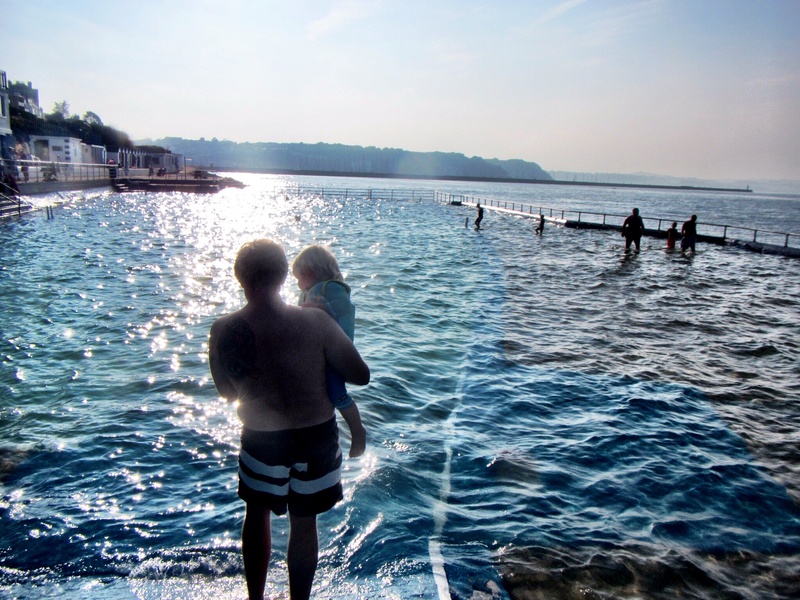 I know I have returned with a new passion for making Shoalstone the best that it can be, and with a sense of being part of a community that I never really knew existed. 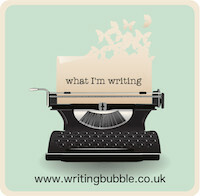 But I have also returned with a stronger sense of myself as a writer, of someone with stories to tell and a bubbling desire to get them out into the world. 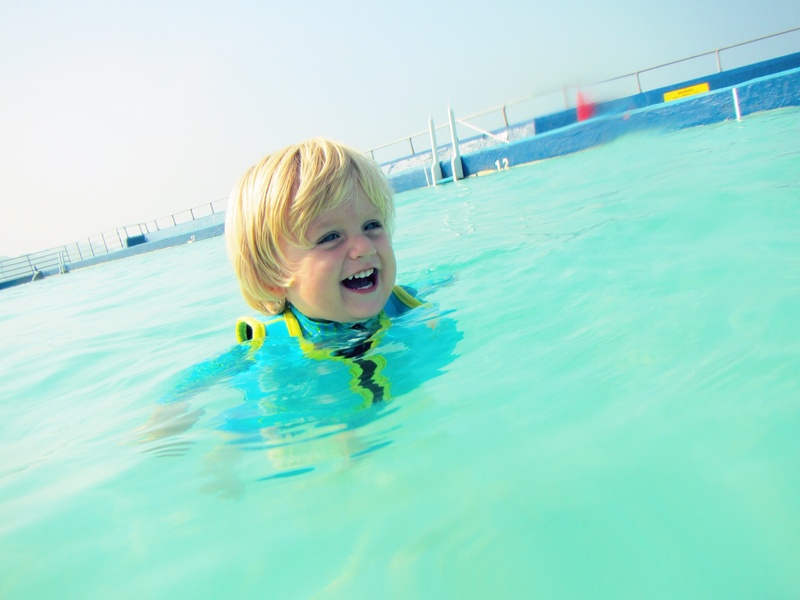 Not bad for a day and a half of lido chat – and even better for the fact that all it will take to reignite this passion if ever it begins to fade is to slip beneath the waters of one of the many outdoor pools we have at our disposal in this country. First stop: Kings Cross Pond this afternoon, and hopefully Parliament Hill Lido tomorrow too. 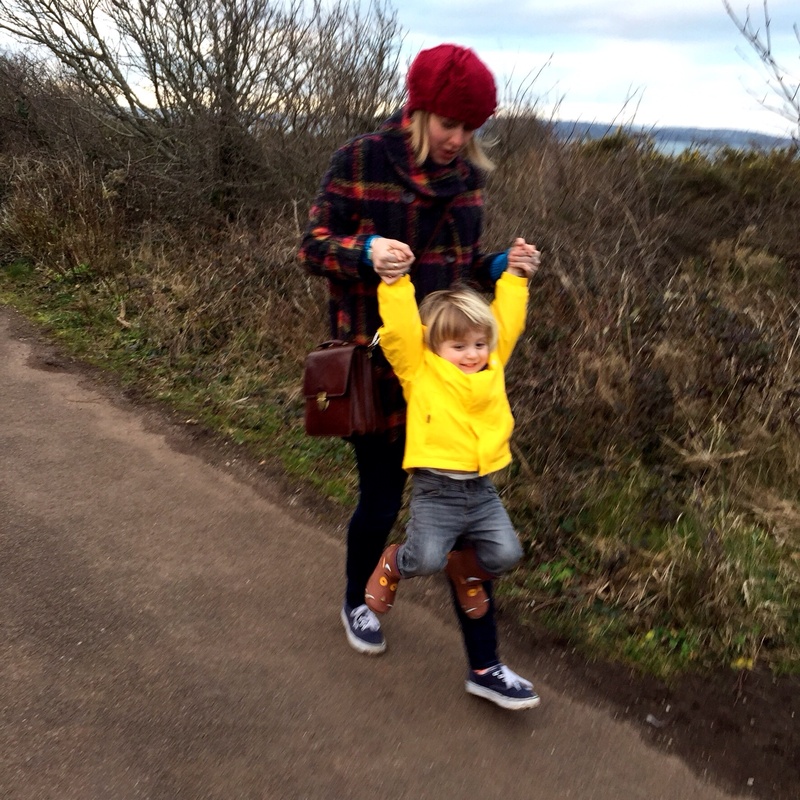 Arthur and I are on our way up to London on a far less exciting mission than seeking outdoor swimming opportunities, but one other thing last weekend has taught me is that they are never far away – and I intend to take advantage of them whenever (and wherever) I can. 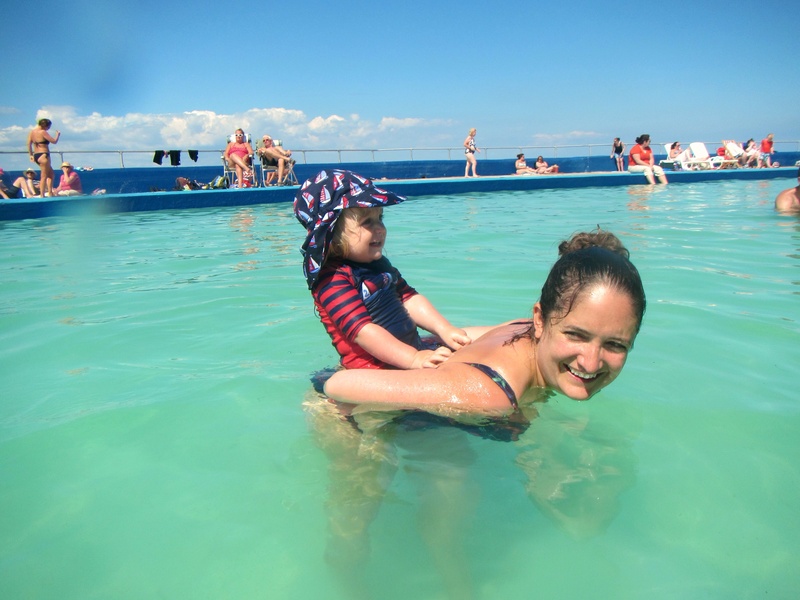 This entry was posted in Sophie is reminiscing, Sophie is swimming, Sophie is travelling, Sophie is writing, Uncategorized and tagged identity, lido love, lido road trip, lidos, national lido conference, sense of self, shoalstone pool, writing on September 21, 2016 by sophieblovett. We never seem to manage to go swimming nearly as much as I’d like to during the winter. I’m not a fan of indoor pools, with their chlorine and claustrophobic changing rooms, and there always seem to be more appealing ways to fill the colder days. Summer, though, is a whole other matter. 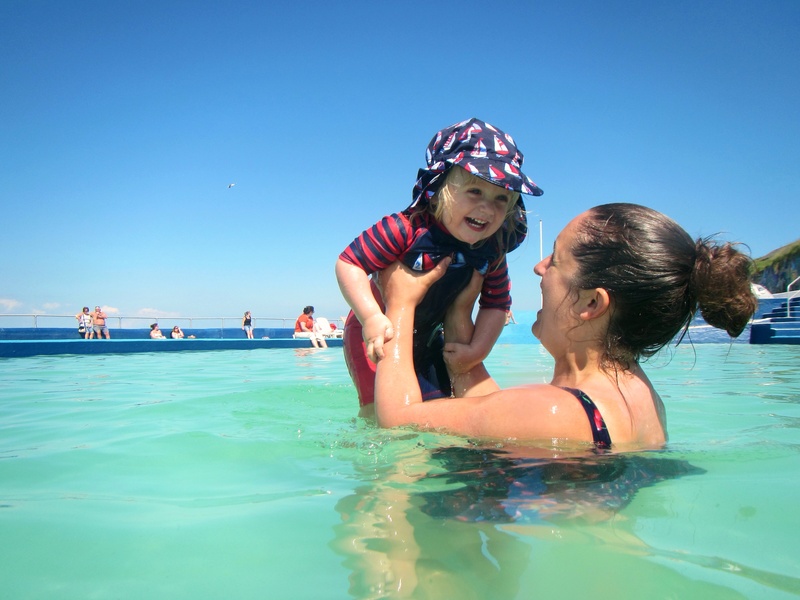 We are lucky enough to live within metres of not only the beach but also a wonderful seawater pool. It has struggled for survival over recent years, but with the help of an army of local volunteers (of which I am one) its future now looks bright. 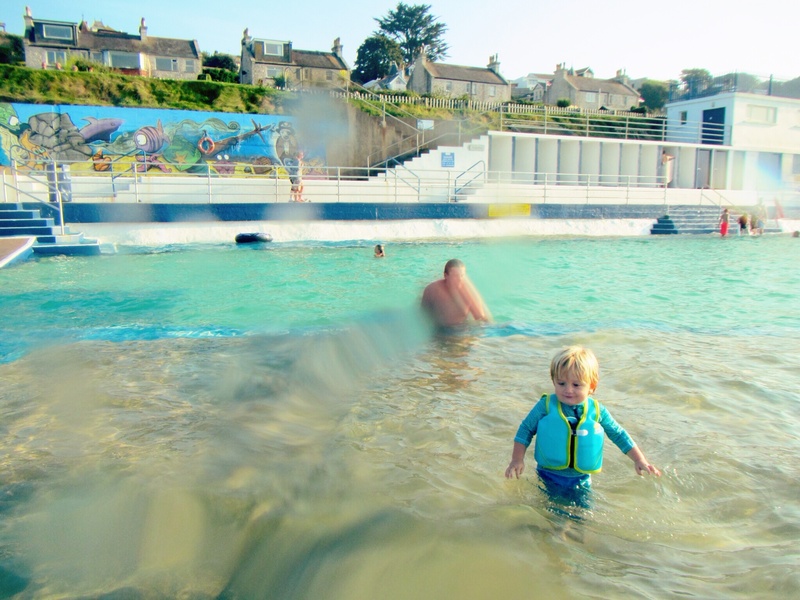 So many local children have learnt to swim here in the ninety years that the pool has been in existence, and I am thrilled that Arthur is going to be one of them. 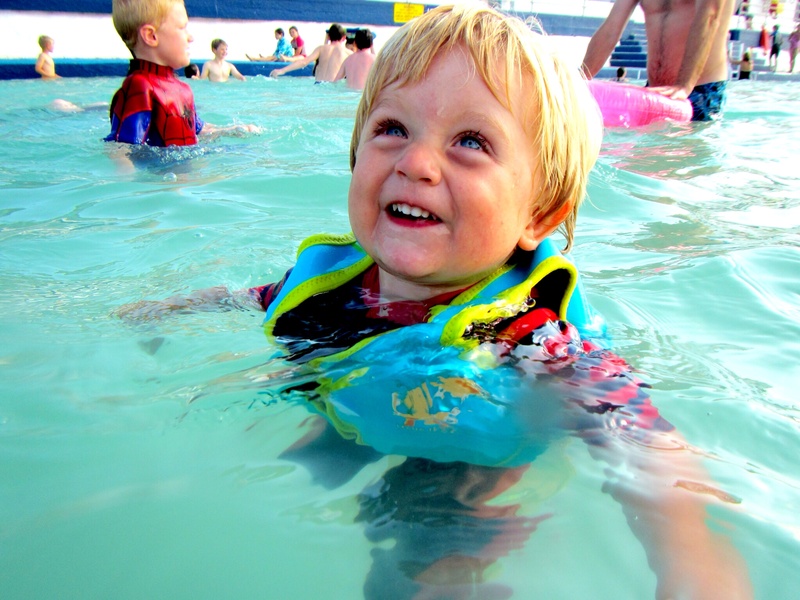 He has yet to have a formal swimming lesson, but he is so completely confident in the water with his float suit that I am sure that when he is ready to go it alone he will not struggle to work it out. 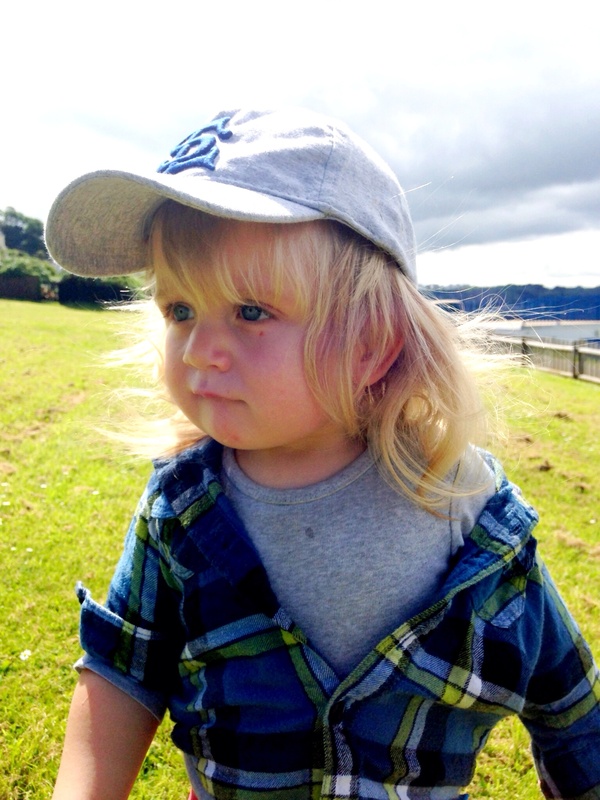 He will certainly be getting lots of practise over the next couple of months. 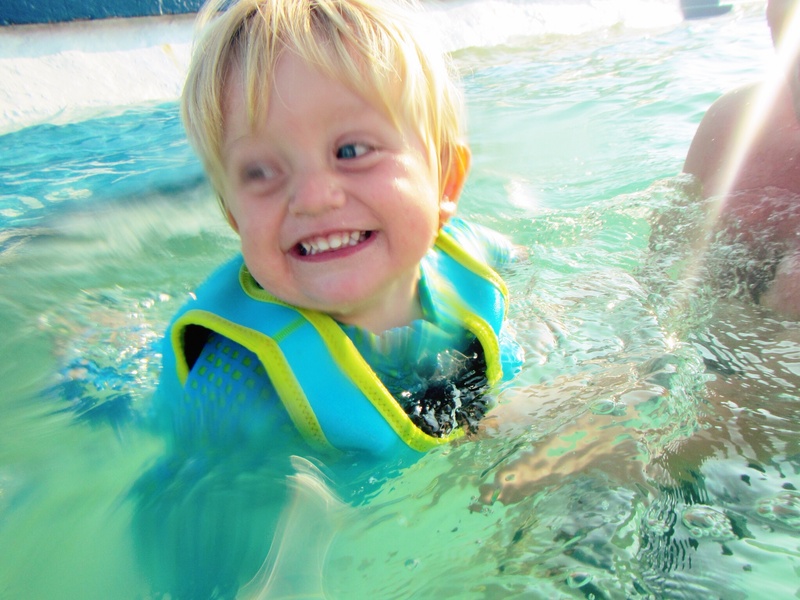 This week, we have been down to the pool almost every day. 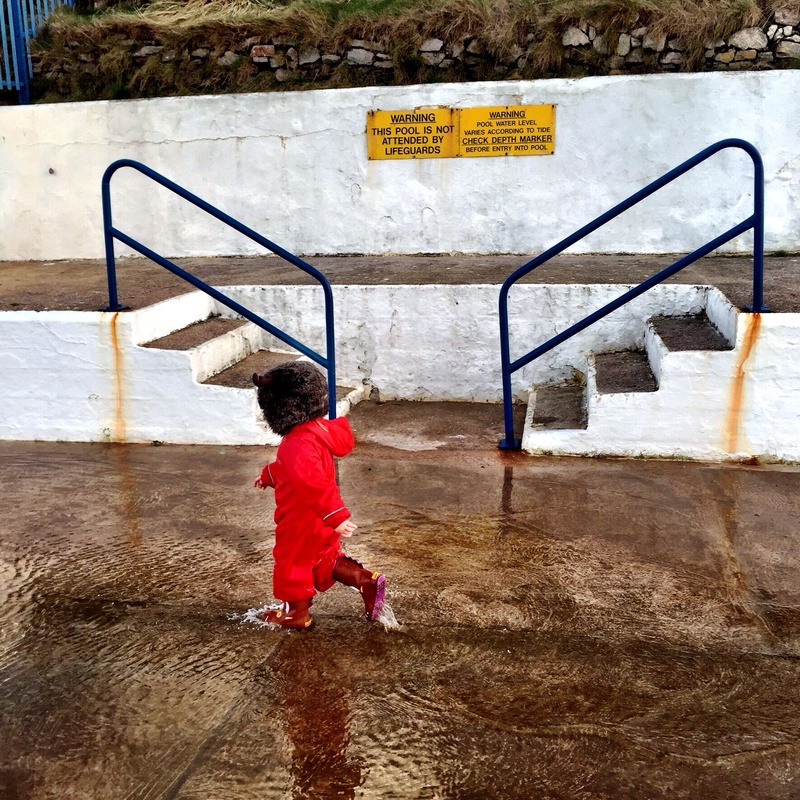 We’ve had spring tides, and when they’ve been high the water has spilled over the sea walls and onto the deck, creating the perfect area for splashing around. 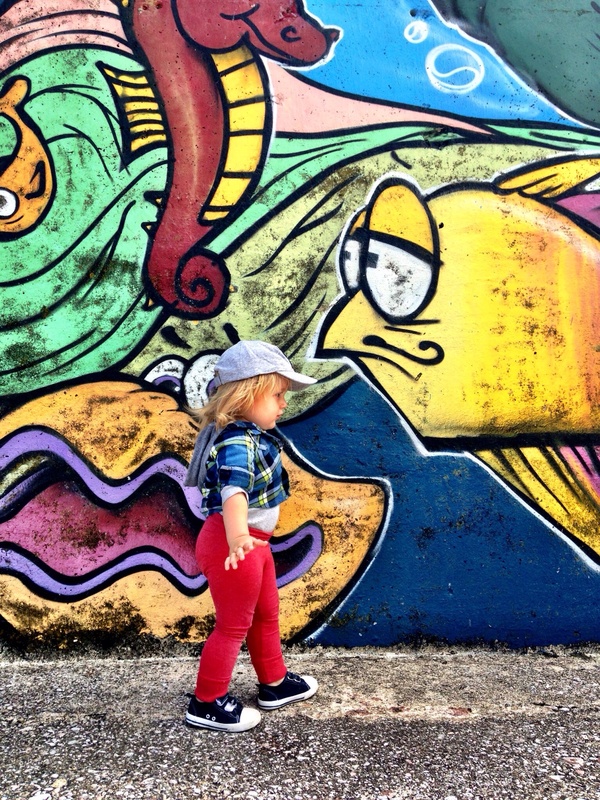 Arthur can stand in the shallow end too, and loves the freedom that gives him. 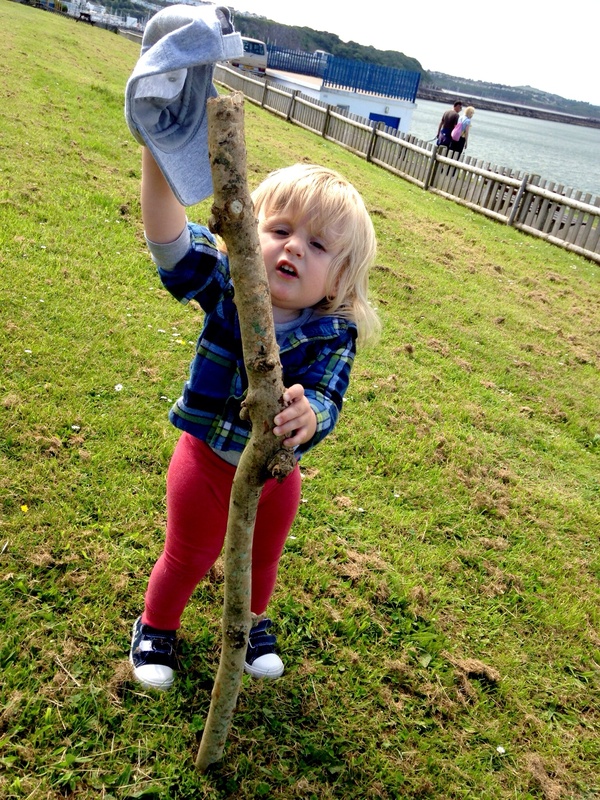 Together we have ventured deeper, practising kicking legs and blowing away the water that splashes over his face. 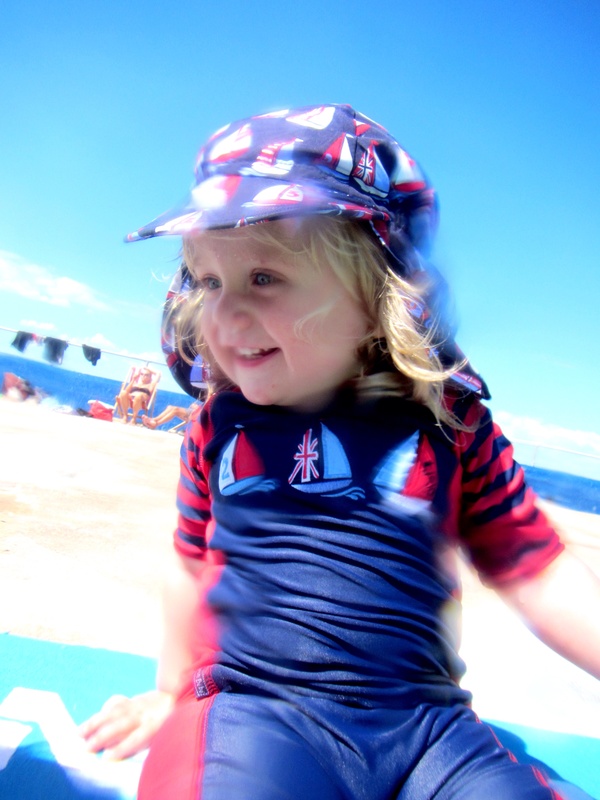 We may have not got round to formal swimming lessons so far, but he is learning so much just by exploring and seeing what his body is capable of. 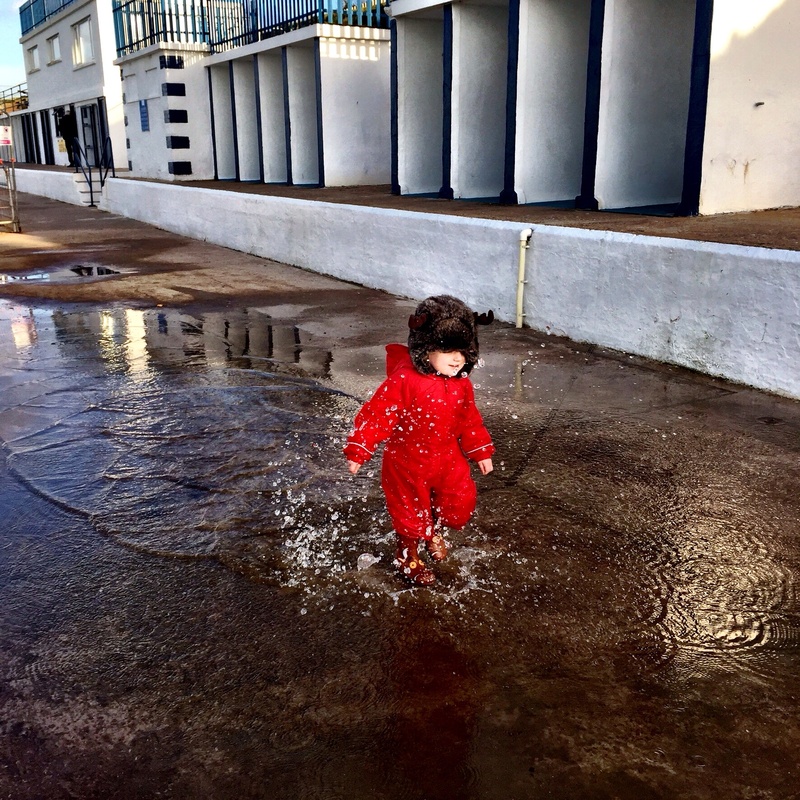 I love that our pool is safer than the sea, but is so close to it that Arthur is still able to understand the particular power of the ocean and learn to respect the watery world that is never far away down here. And selfishly, too, I love nothing more than the feeling of cold, salty water on my skin when the sun is hot. We’ve been doing pretty well on that front this week: long may it continue! 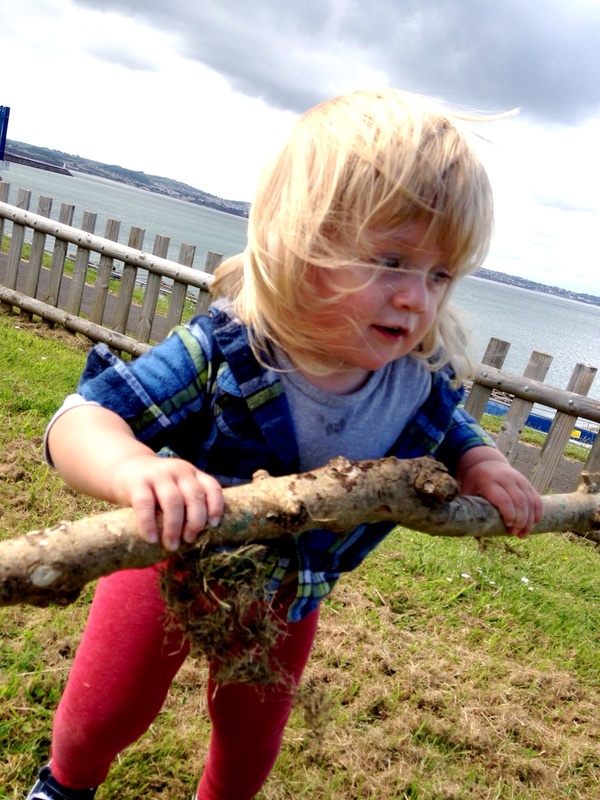 This entry was posted in Sophie is educating, Sophie is parenting, Sophie loves Brixham, Uncategorized and tagged Childhood, learning, outdoor swimming, sea, seawater pool, shoalstone pool, swimming, unschooling on June 9, 2016 by sophieblovett. 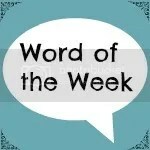 My word of the week this week is puddles. 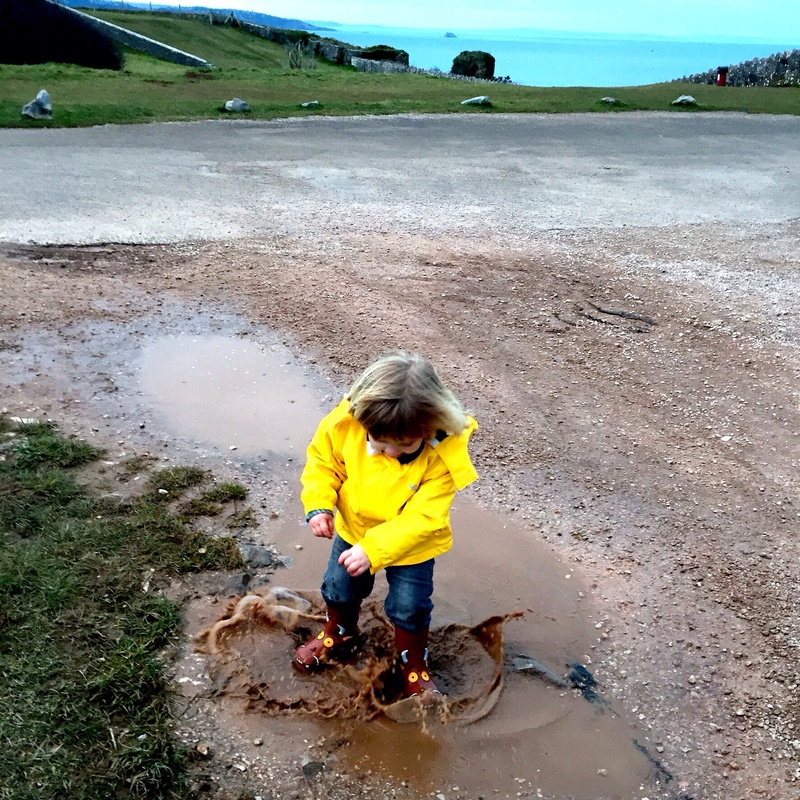 This entry was posted in Sophie is parenting, Sophie loves Brixham and tagged puddles, seaside life, shoalstone pool, splashing, winter on February 20, 2015 by sophieblovett. 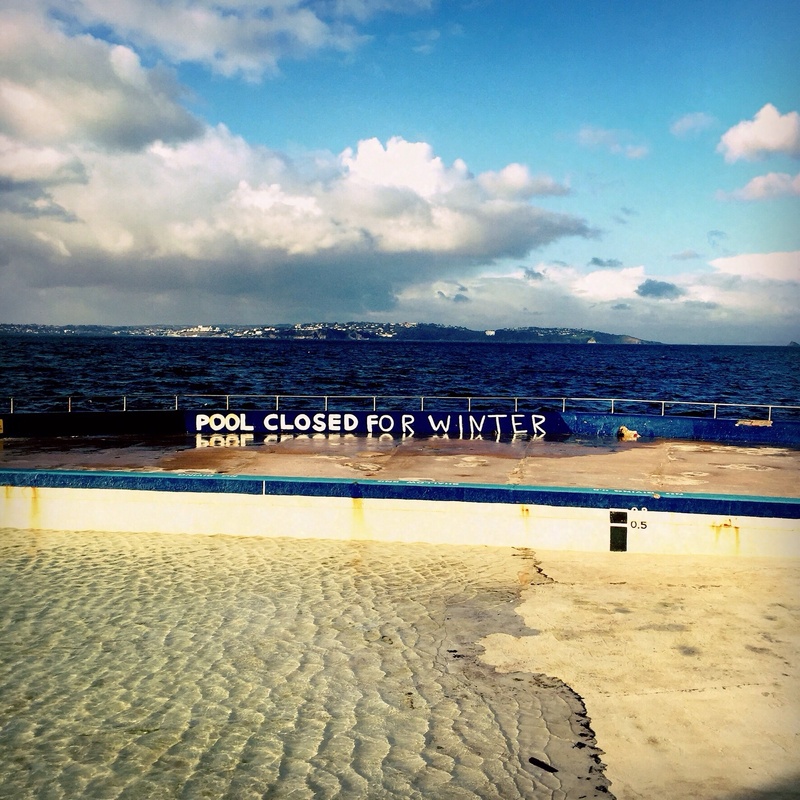 Yesterday marked the end of the season at Shoalstone Pool. 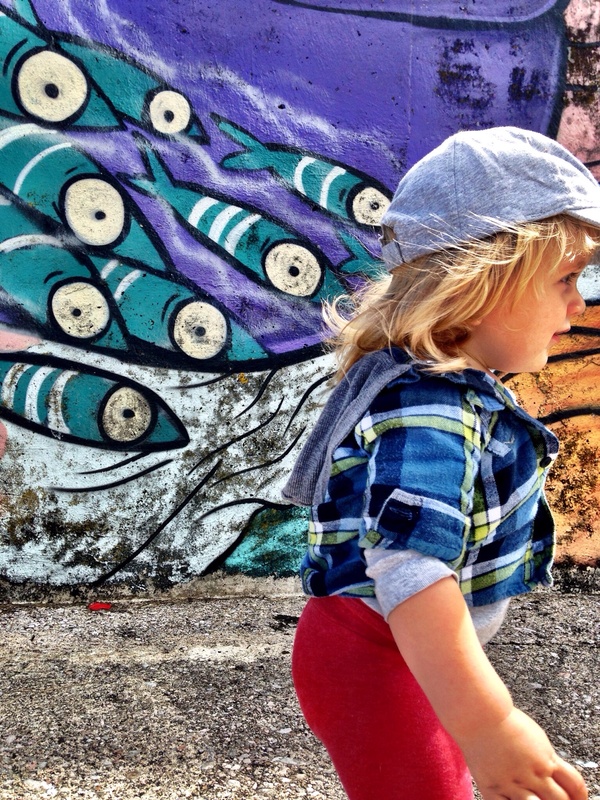 It seems to have come round far too quickly, especially with this gloriously warm September. But it has been a fabulous few months, and I think we can safely say we made the most of the incredible facility we have on our doorstep. 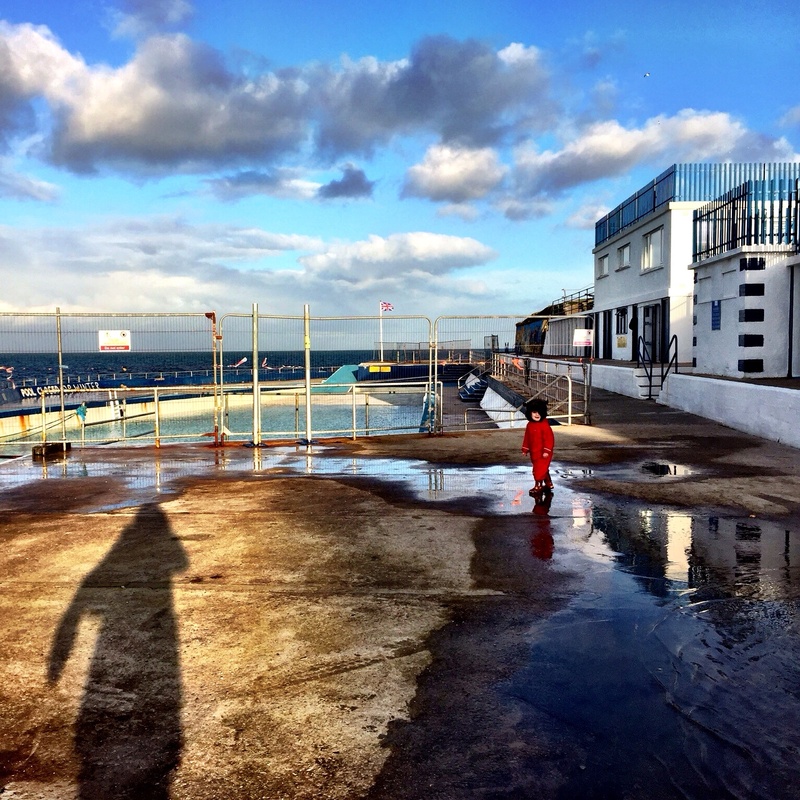 It feels like a very long time ago that we were doubting whether the pool would even open this year at all: when there were still wranglings with Torbay council over funding and the fallout from their ill-omened deal with a local dive company. 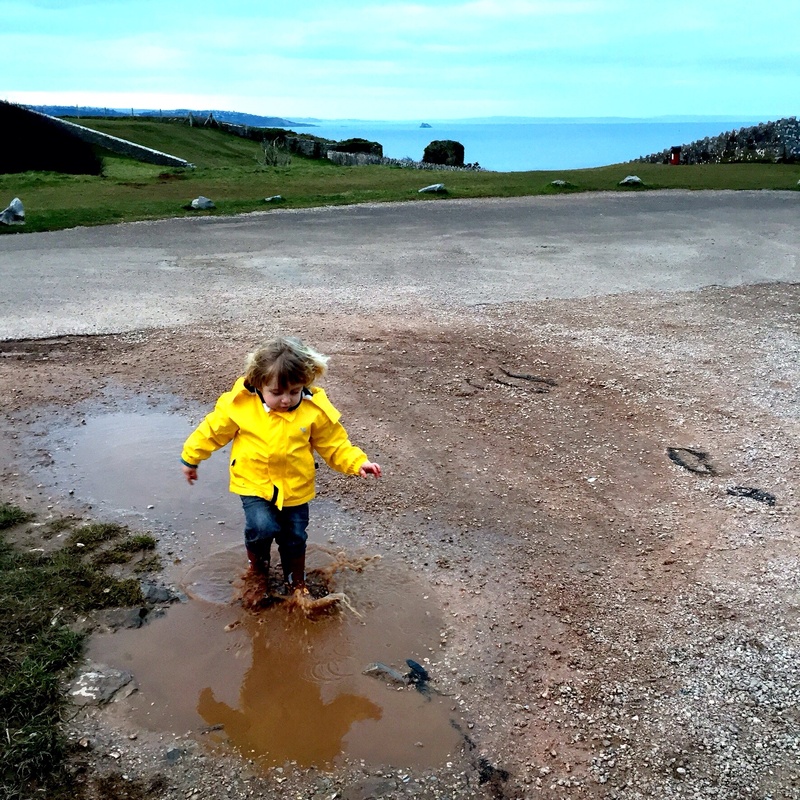 Luckily Brixham town council came to its rescue and it opened for the season at the end of May: we took our first dip of the summer a couple of weeks later. Since then we’ve been there as often as we can. Arthur’s swimming has come on in leaps and bounds: back in June he was still holding on to us as we took those first dips in the then icy water. But then came his float suit, and with it a whole new lease of life. 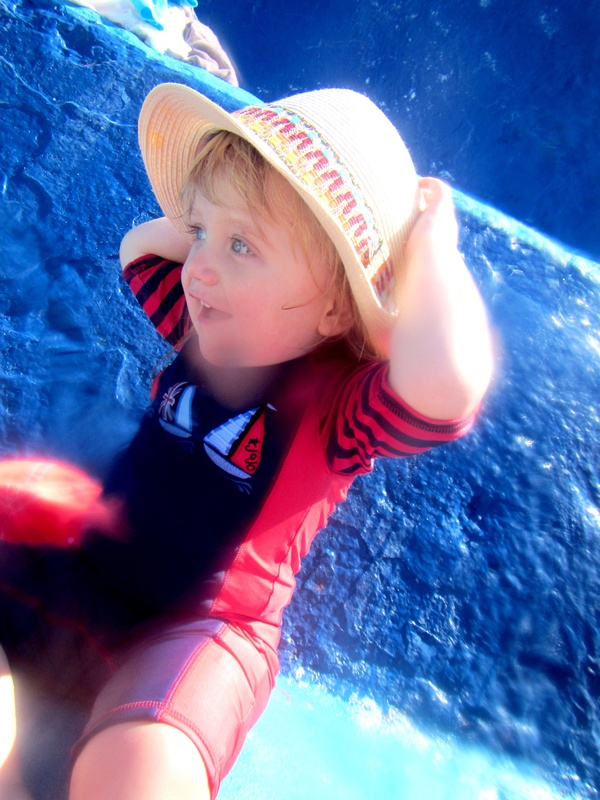 He loves the independence it has given him, and confidently navigates himself around the pool as we hover nearby. 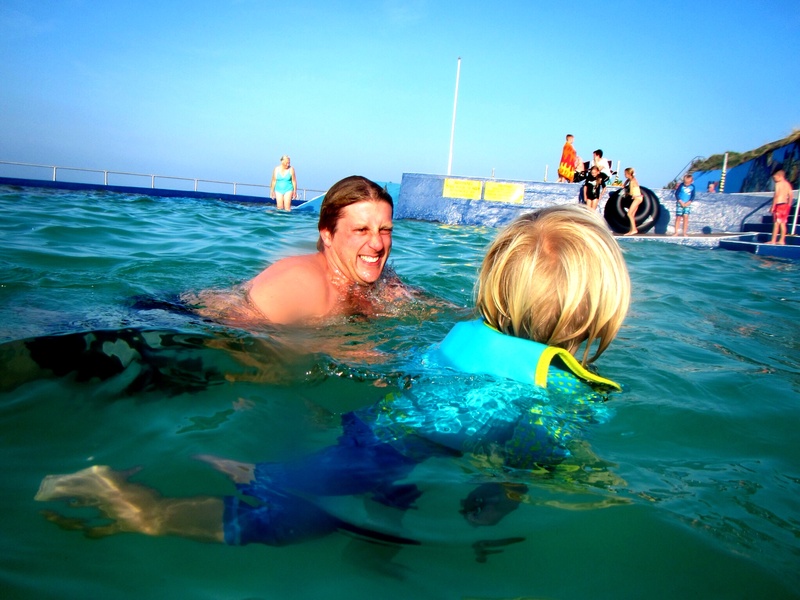 It’s been fantastic to see the pool so busy over the summer holidays – kids learning to swim or splashing about under the watchful eyes of the lifeguards, adults doing lengths with a look of bliss on their faces, locals and tourists alike enjoying the safety of the enclosed pool whilst still getting the invigorating benefits of the seawater. And of course the location is all but impossible to beat. 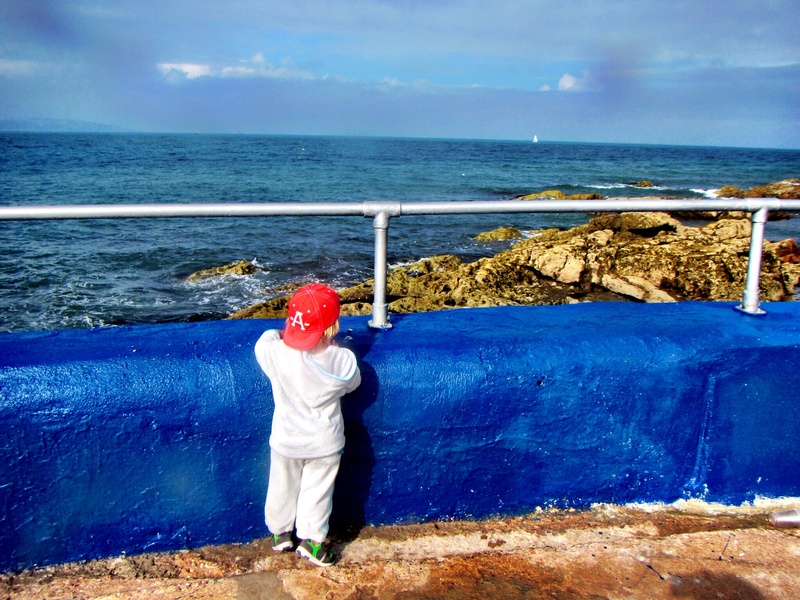 When he’s not in the pool itself Arthur has loved gazing over the wall to the sea, watching boats or fishermen and even catching the odd glimpse of our local friendly seal. With a summer like this, it was apt that our final swim of the year should be particularly special. We were determined to get down there yesterday but as so often the day ran away with us and it was almost five o’clock by the time we were walking out of the door. 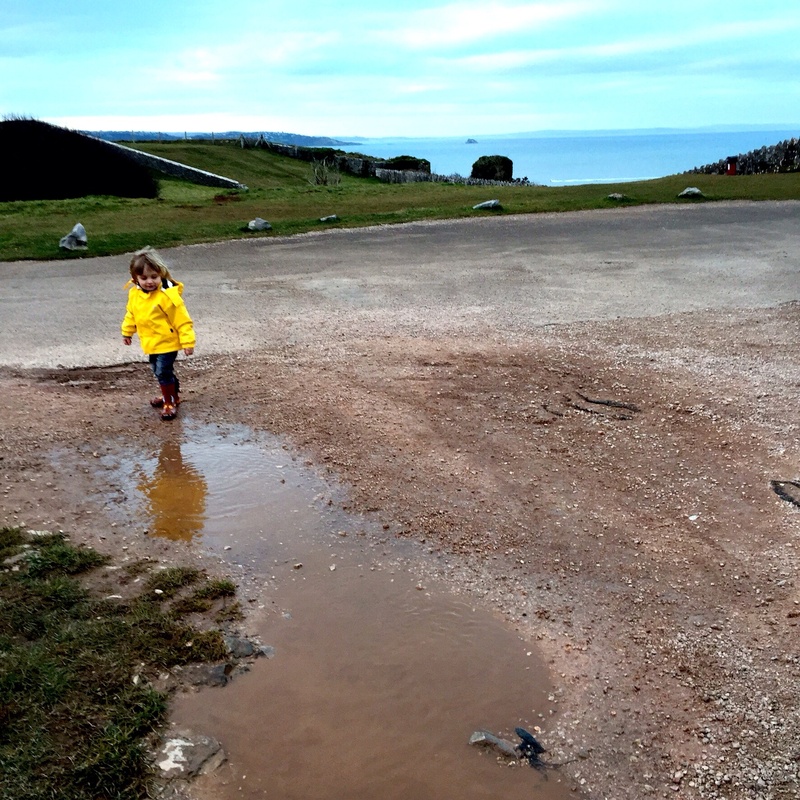 As we approached the pool it became clear that it was an especially high tide: the sea was lapping over the wall by the deep end, and even the shallow end was not particularly shallow. Although it was a gorgeous afternoon the water was rougher than usual, and we did wonder the wisdom for a moment of taking a toddler in for a dip. 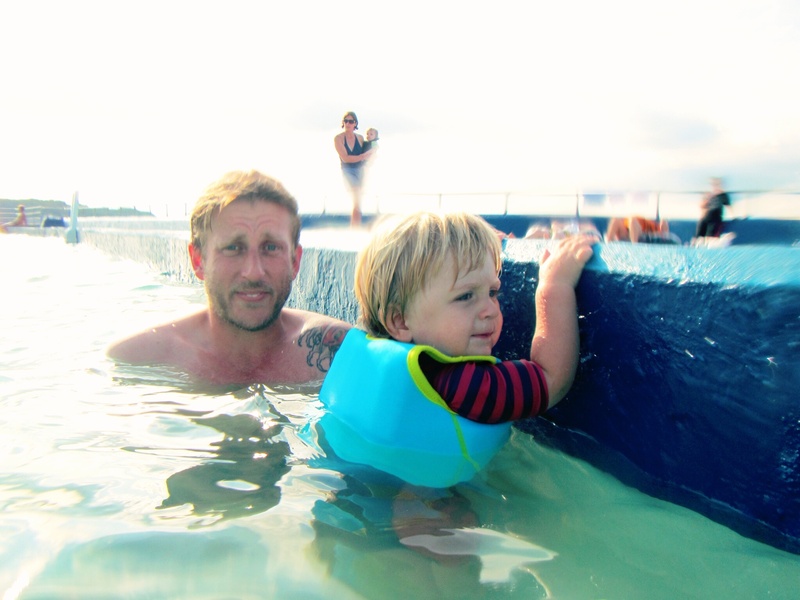 We needn’t have worried though: Arthur of course took it in his stride, loving the novelty and the sense of occasion and happily swimming along beside his daddy. 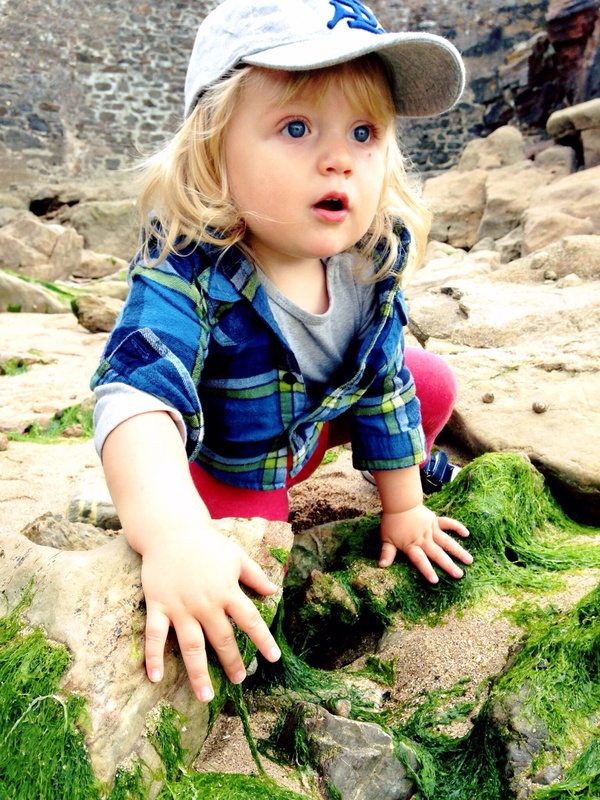 He ventured out on to the ‘poolside’ too, splashing through the water to take a peek over the sea wall. As the sun began to set and the tide continued to rise, it was almost as if the sea was reclaiming the pool for another year. As the summer fades and autumn turns into winter those sea walls will be battered by storms, and we will marvel that we ever swam in sunshine there. 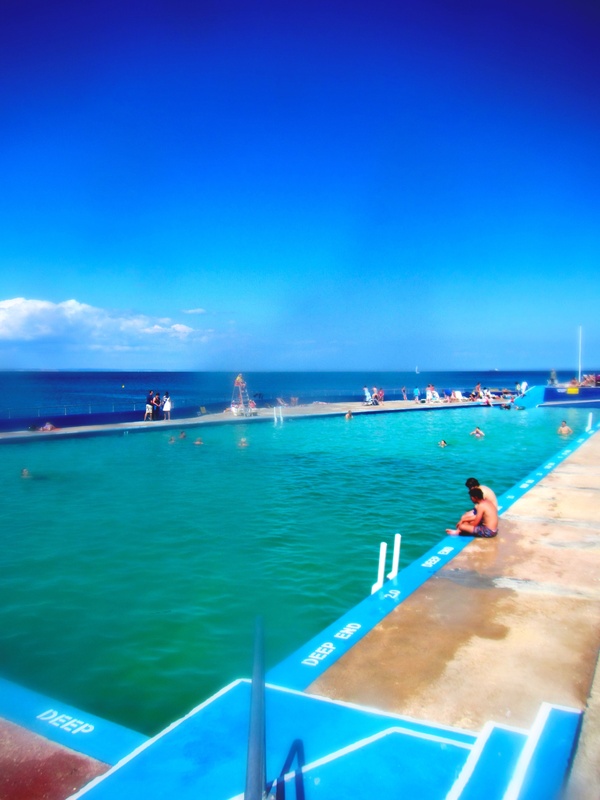 Shoalstone Pool is such a very precious place, and I cannot wait for it to be reborn again next year. To find out more about the pool and how you can help support it go to www.shoalstoneseawaterpool.co.uk. 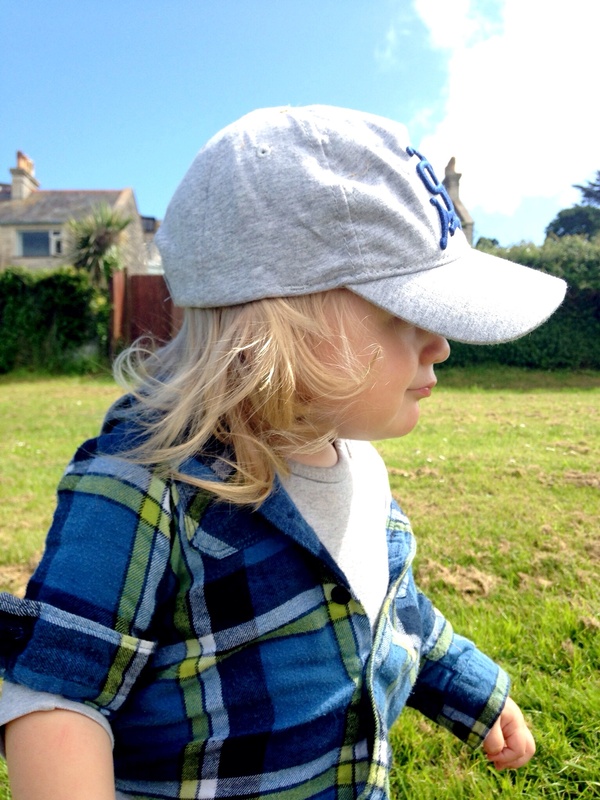 This entry was posted in Sophie is parenting, Sophie loves Brixham, Sophie loves Devon, Uncategorized and tagged brixham, lido, outdoor swimming, seawater pool, shoalstone pool, Torbay on September 8, 2014 by sophieblovett. It’s been coming for a while, in the gloriously light evenings and the no need to take a jacket when we leave the house, but today summer finally arrived. 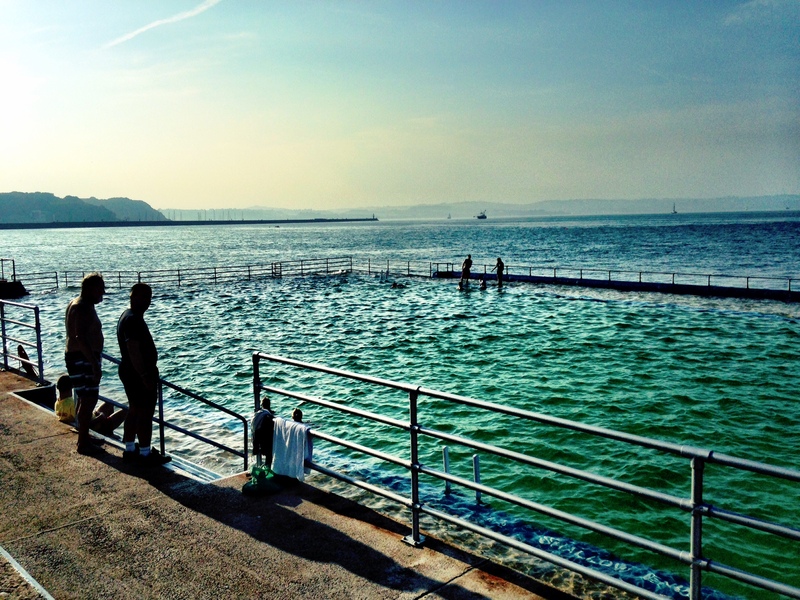 In scorching sunshine we finally made our way to Shoalstone Pool for the first dip of the season. 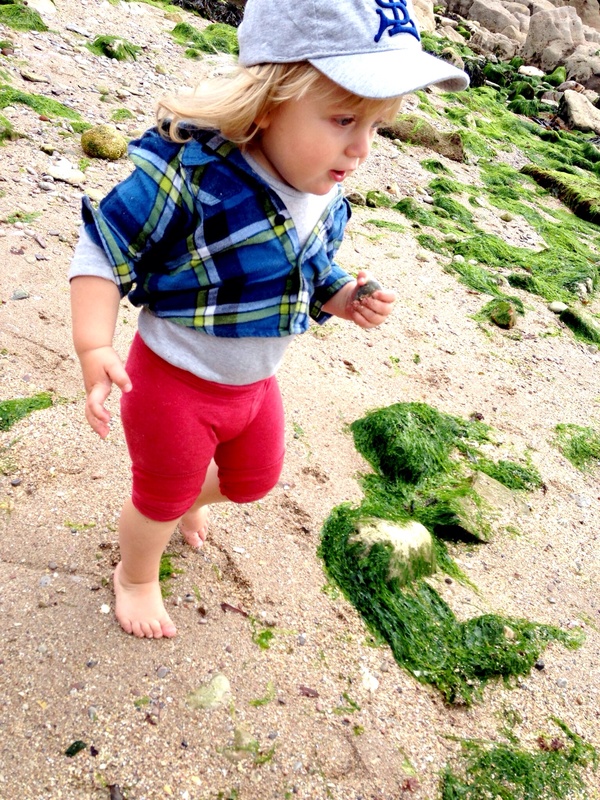 Arthur was so excited: we barely had time to get him into his swimmers before he was running towards the water. He definitely found it cold at first, but each time we lifted him out he was desperate to get back in again. Before long we had both got used to the cold – after the initial shock it really wasn’t that bad, and now that I’ve broken the ice (so to speak) I’m determined to fit some regular swims into our routine. Arthur being Arthur there was quite a lot of splashing – hence the somewhat blurry photos where I forgot to wipe the lens… But it was brilliant to see him having so much fun! I think he would happily have stayed in the water for hours, but we figured we’d better not let him get too cold. 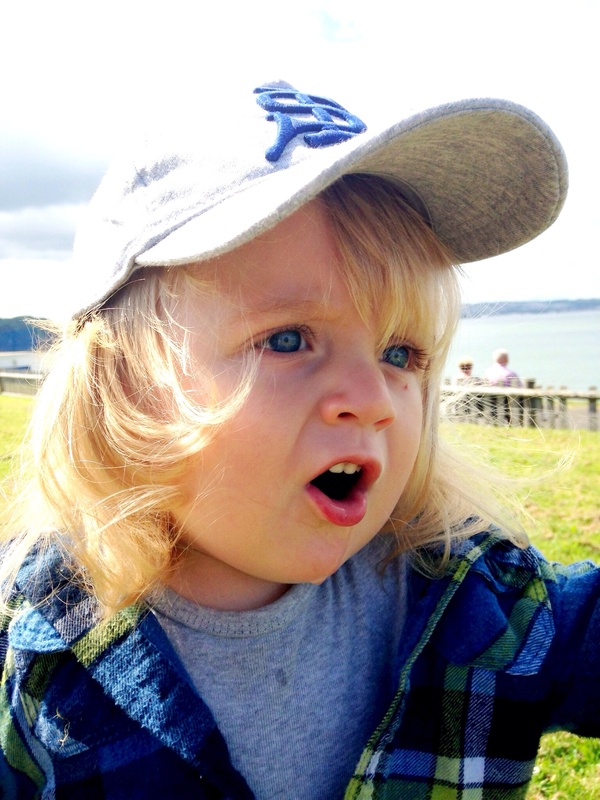 He protested a bit at first but then was happy to entertain himself with my hat for a while. 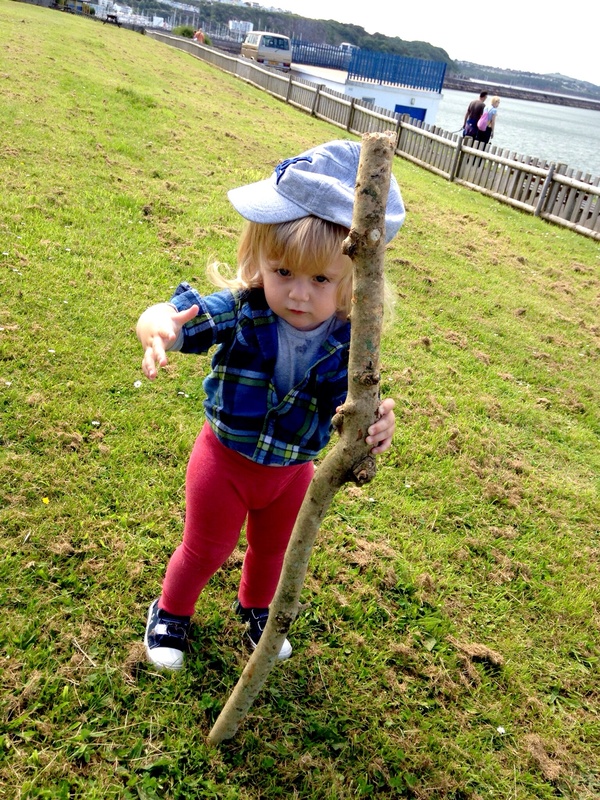 We went for a wander to get some ice-creams (it’s summer right?) which gave us a chance to look back at the pool in all it’s glory. It was so great to see so many people enjoying the water and the spectacular setting – unbelievable to think it almost didn’t open at all this year! It wasn’t long before Arthur was desperate to get back in again, this time splashing around in the shallow end with the kids who’d started piling in at the end of their day at school. 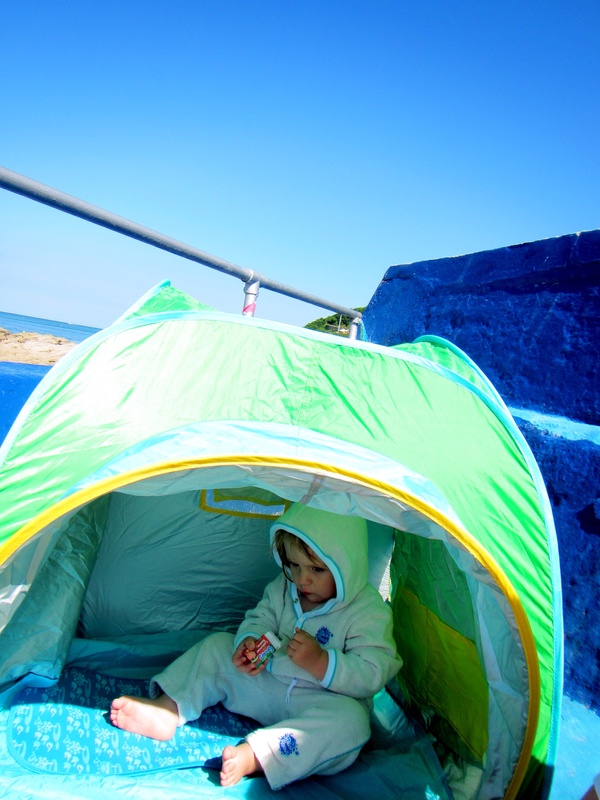 Eventually though he did begin to shiver, and was grateful to be wrapped up warm with raisins and take a moment to relax out of the sun in his little ‘house’. Which gave Leigh and I a chance to look out over the bay and take in the view. And what a view it was. 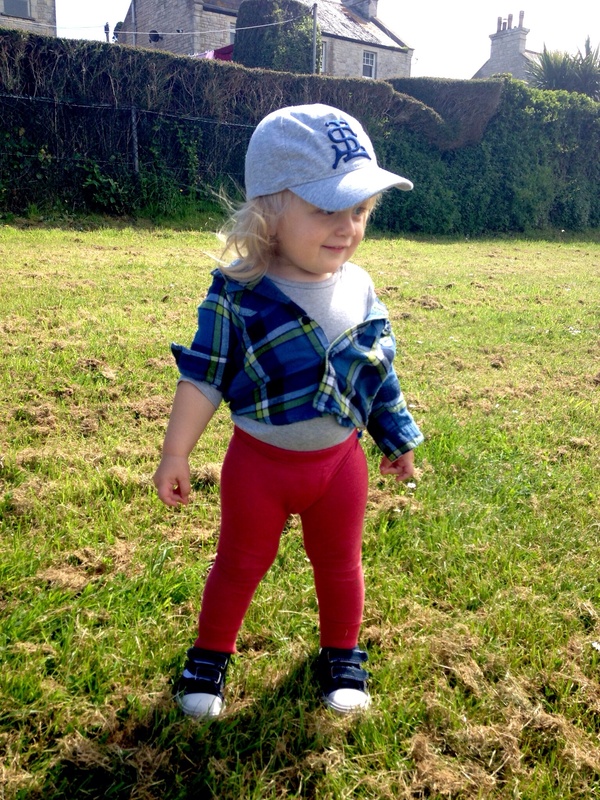 It’s lovely to see you summer! Very much looking forward to getting acquainted again over the next couple of months. 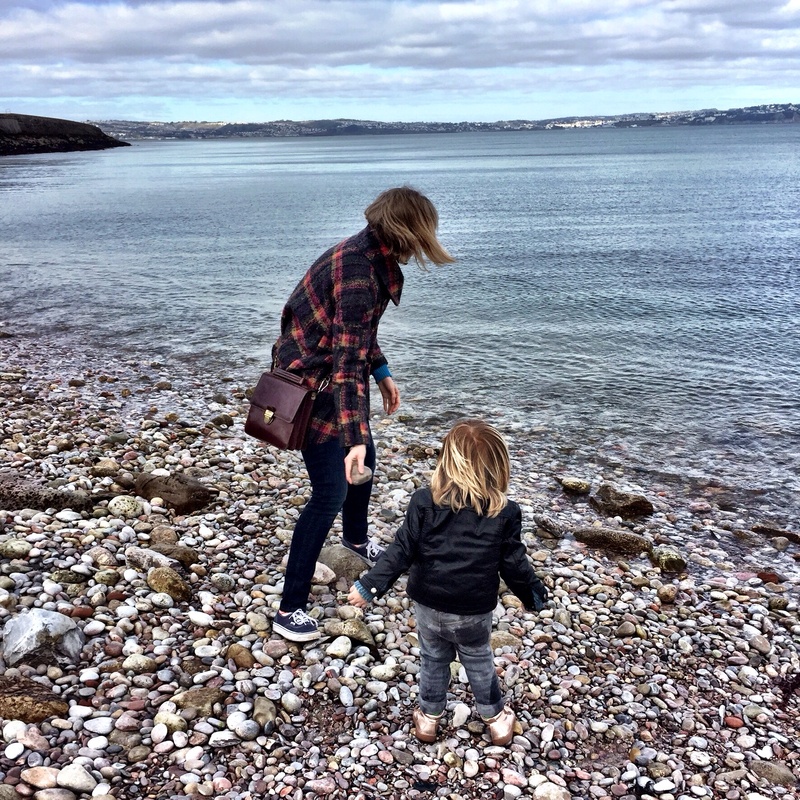 This entry was posted in Sophie is parenting, Sophie loves Brixham, Uncategorized and tagged brixham, lido, light evenings, outdoor swimming, saltwater, sea, shoalstone pool, summer on June 14, 2014 by sophieblovett. I absolutely love this time of year. In the midst of winter I forget, I think, just how long and light the evenings are in June: the contrast with the dark and the cold of only a couple of months ago, especially down here, is hard to fathom. A couple of evenings ago we went for a walk after dinner. Just the usual round-the-block stroll, past the pool as the sun was lowering itself down towards the horizon, the streaks of clouds providing the perfect canvas for its rays. 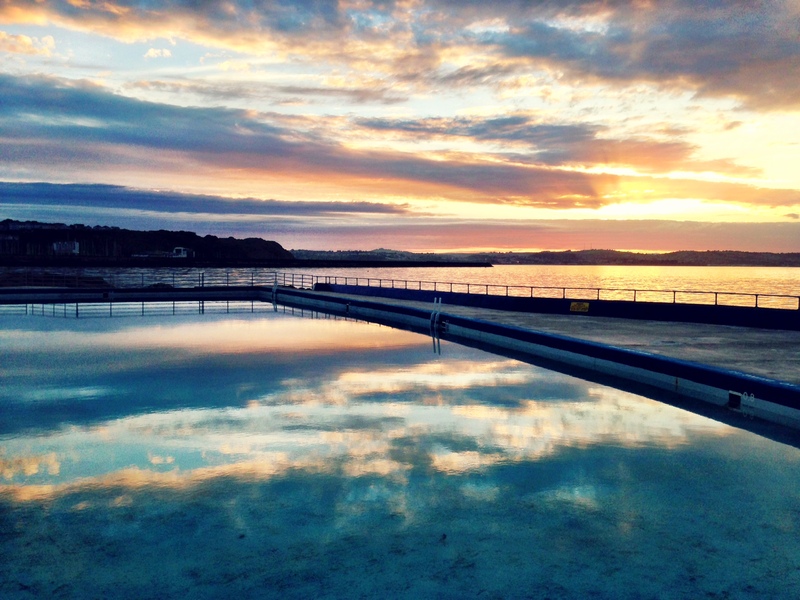 The sea was calm, gently lapping against the rocks as the scent of seaweed wafted up through the warm air, and the pool itself was like a mirror. We were the only ones there, apart from a man walking his dog and humming to himself. It felt more than a little bit like heaven. 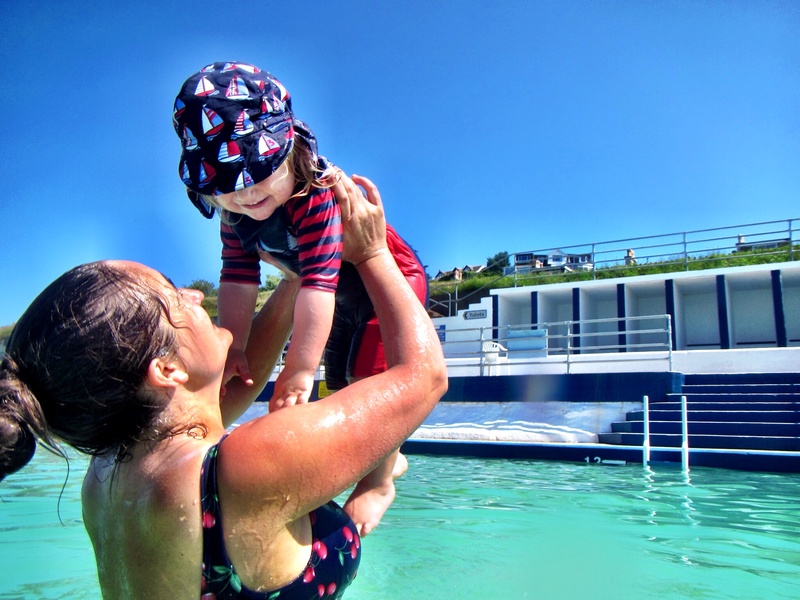 This entry was posted in Sophie is photographing, Sophie loves Brixham, Uncategorized and tagged #alphabetphoto, brixham, shoalstone pool on June 11, 2014 by sophieblovett. After a couple of hectic and exciting weeks away in Cornwall and entertaining visitors here we’ve actually quite enjoyed being at home on our own this week. I’ve had lots of writing and admin to catch up on, and it’s been nice having Brixham to ourselves again now that everyone’s gone home after half term. 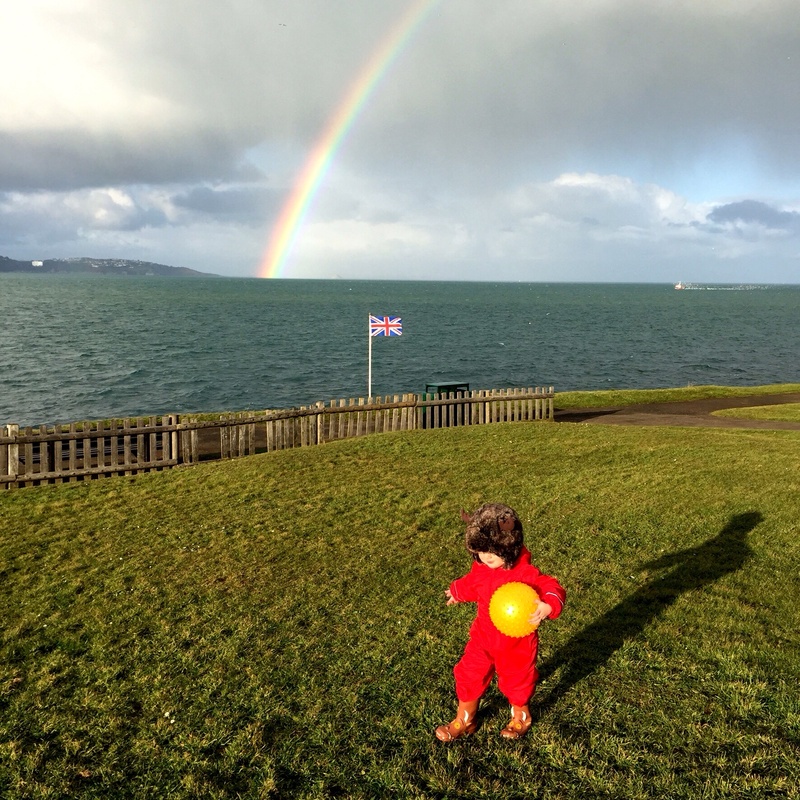 On Monday afternoon, as the sun broke through the clouds and Arthur’s patience began to wane after I’d spent far too long at the computer, I thought we’d better get outside. 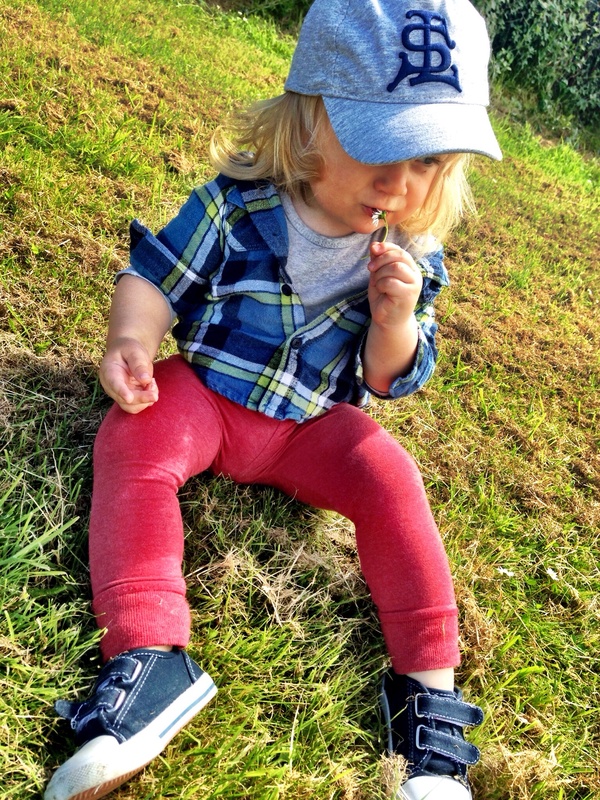 He found some daisies, and as usual had to check out how they tasted. 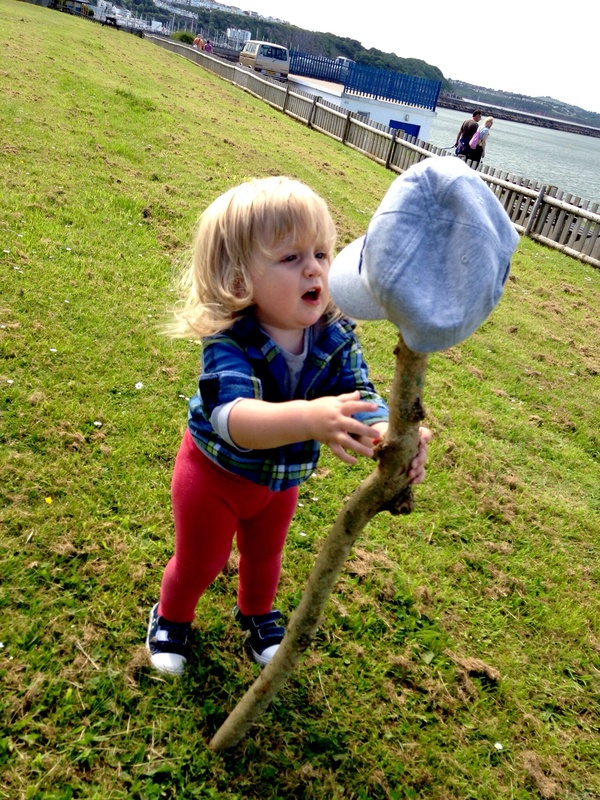 Even more exciting was when he came across a stick: he tried to dress it with his hat, though in the end decided it looked better on his head. 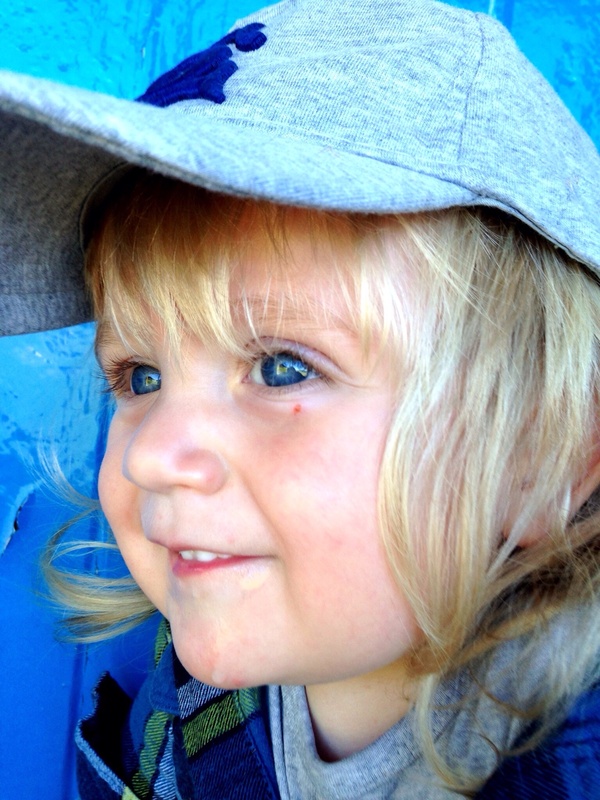 This is my favourite shot I think – contented and a little pensive in the shelter overlooking the pool. 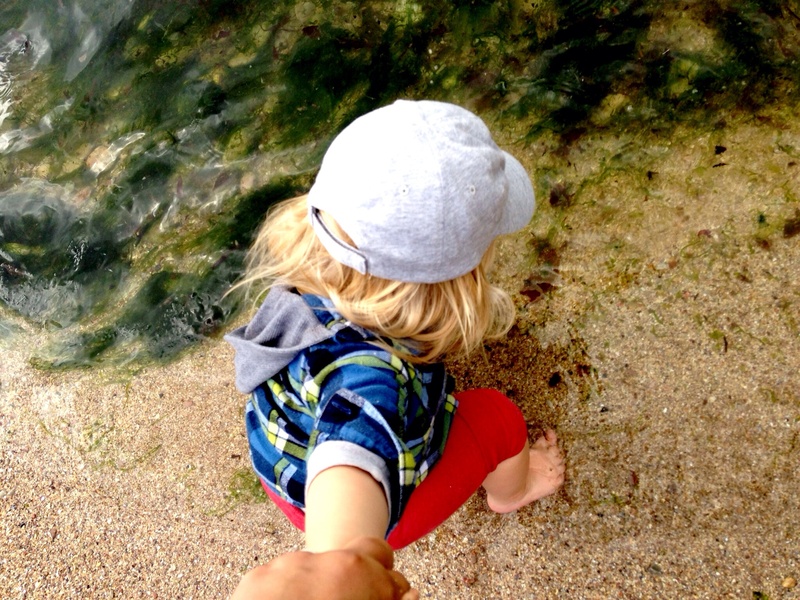 Of course it wasn’t long before he persuaded me to take him down the steps to be a bit closer to the water. 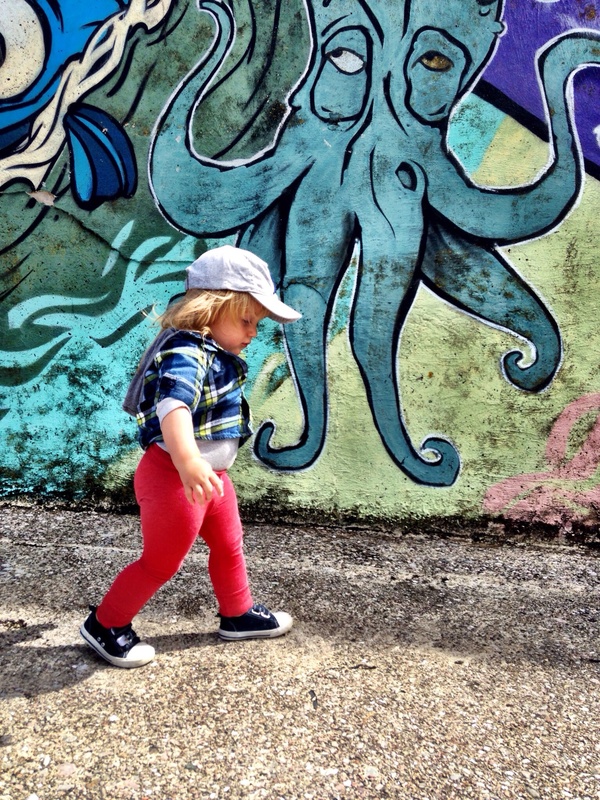 The pool was being cleaned (which made me feel better about not having made the effort to get our kit together for an inaugural dip), but as always Arthur loved taking a stroll alongside the mural. He was inching closer and closer to the sea though, and I soon gave in and took him down to the little beach at the end of the rocks. I don’t think I’ve actually been down there with Arthur before. There’s only really a beach at low tide, and if the wind’s been blowing in the wrong direction it can be a bit of a magnet for rubbish. 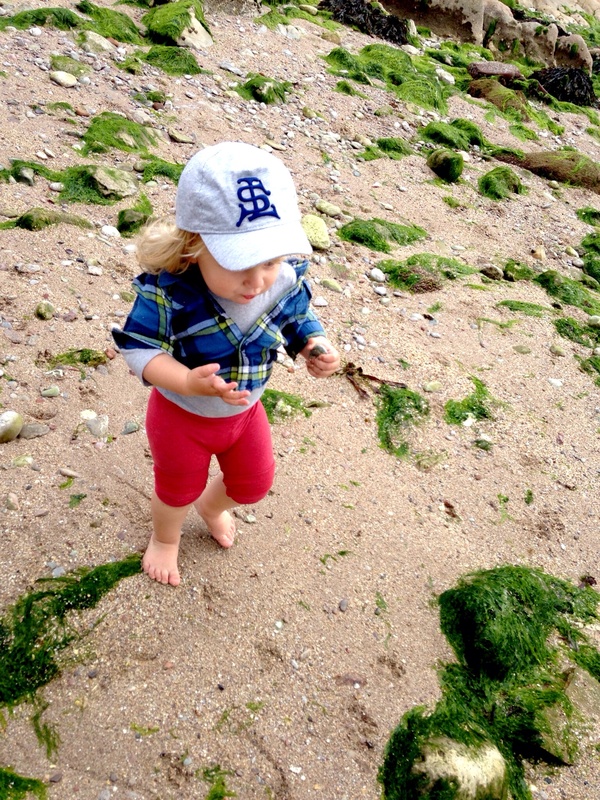 But Monday afternoon was perfect – lots of sand and gently lapping water. Arthur was in his element. We didn’t last that long, as once he’d dipped his toes in the water he couldn’t resist sitting down – my reflexes were not quite quick enough so he ended up with a very damp bottom! As we’d been just nipping out I was of course completely unprepared. 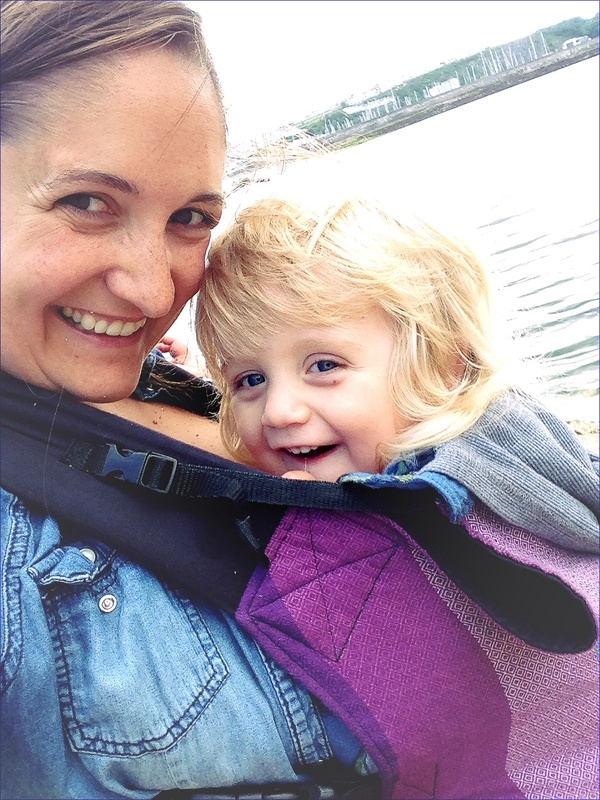 There was a bit of protestation as I whipped him up into the sling, but once he was there he was happy just to snuggle up as we strolled back home for supper. 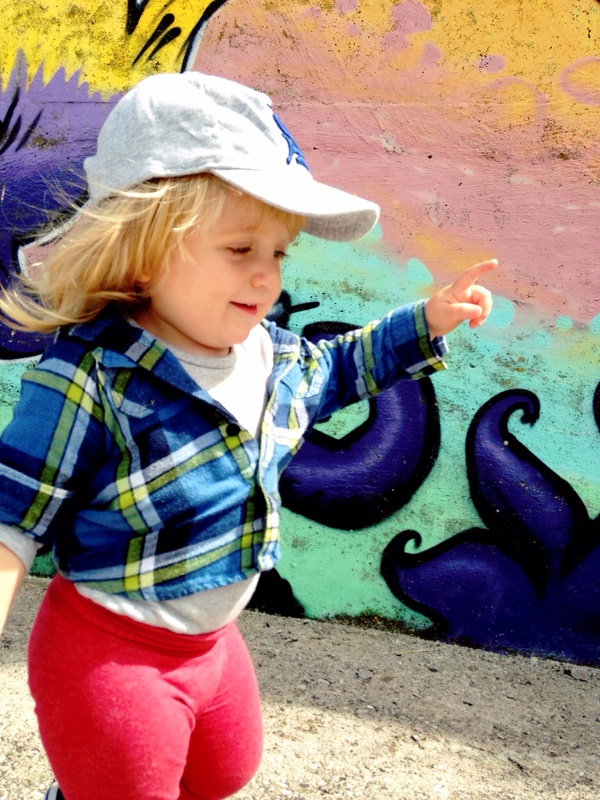 A perfect little jaunt, and one which I’m sure we’ll repeat many many times over the summer: just hanging about in the hood. 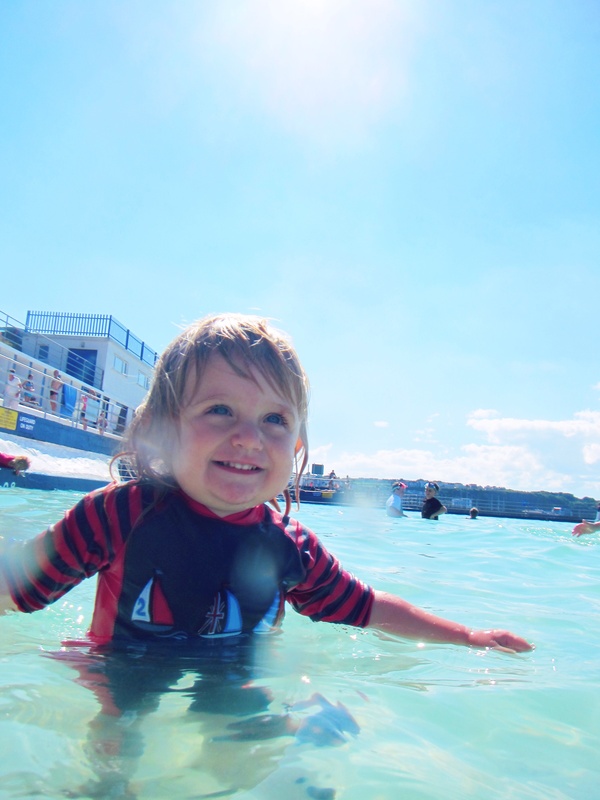 This entry was posted in Sophie is parenting, Sophie loves Brixham, Uncategorized and tagged brixham, shoalstone pool, toddler on June 7, 2014 by sophieblovett.